In this Times-Gazette file photo from Saturday, April 6, Fairfield’s Halle Hamilton prepares to throw to first base at Fairfield High School where the Lady Lions battled the McClain Lady Tigers in a 3-1 non-conference victory. 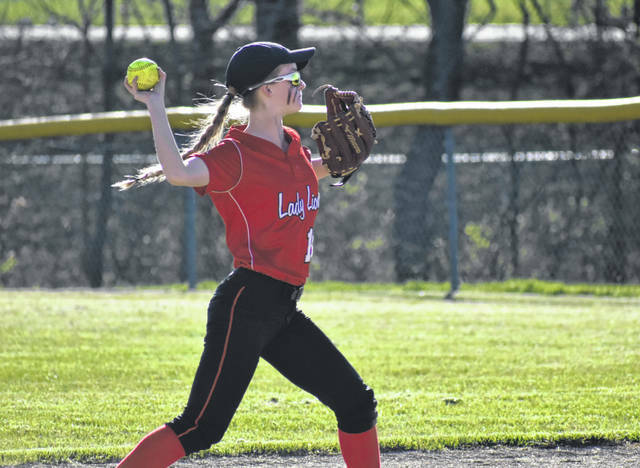 The Fairfield Lady Lions (15-1, 8-0 SHAC) saw their record setting winning streak come to an end when they lost to the undefeated Williamsburg Lady Wildcats (17-0, 8-0 SAAB) 4-3 before a standing room only crowd at the Fairfield Baseball/Softball Complex. The first Ohio State Coaches Poll was released Monday and both teams appeared in the top teams in Division III. Williamsburg was listed at No. 7 and Fairfield at No. 5. The game was a classic well played softball game. Williamsburg would take an early 2-0 lead with two runs in the top of the first inning. Faith Golden single to left centerfield and Madi Ogden followed with a double to right centerfield to score Golden. A ground out by Kara Bailey moved Ogden to third base where she scored on a single by Peyton Fisher. Fairfield answered in a big way in the bottom of the first inning. Lyndee Spargur singled to lead off the inning. One out later, Spargur was forced out at second base on a ground ball of the bat of Kaiti White. Harley Flint entered the game as a courtesy runner for White. Layla Hattan drew a base on balls to move Flint to second base. Then Lauren Arnold stepped to the plate and drove an 0-2 pitch deep over the left field fence to put the Lady Lions ahead 3-0. Both teams were scoreless in the second inning. Williamsburg scored two unearned runs in the top of the third inning. Faith Golden swung at a wild pitch on strike three and reached first base on a dropped third strike. Madi Ogden doubled to left centerfield as Golden raced to third base. Kara Bailey then reached first on an error as Golden scored to tie the game 3-3. One out later, Hailey Speeg drove in Ogden on a ground ball out to the left side of the infield to take a 4-3. Both teams put runners on base and threatened to score in the later innings of the game, but both pitchers would strand the runners on base. Leading hitters for Fairfield: Lyndee Spargur (1 for 3), Megan Gragg (0 for 3), Kaiti White (1 for 3, 1 run), Layla Hattan (0 for 2, walk, 1 run), Lauren Arnold (1 for 3, home run, 1 run, 1 rbi), Taylor Lawson (1 for 3), Hayleigh Lowe (0 for 3), Molly Thackston (0 for 3), Halle Hamilton (1 for 3). Kaiti White (15-1) suffered her first loss of the season for Fairfield. Kaiti’s Pitching line: 7 innings, 8 hits, 4 runs, 2 earned runs, no walks, and 11 strikeouts. Madi Ogden was the winning pitcher for Williamsburg. Ogden’s pitching line: 7 innings, 5 hits, 3 runs, 3 earned runs, 1 walks, and 7 strikeouts. Fairfield Lady Lions Assistant Coach Tom Purtell submitted this story.